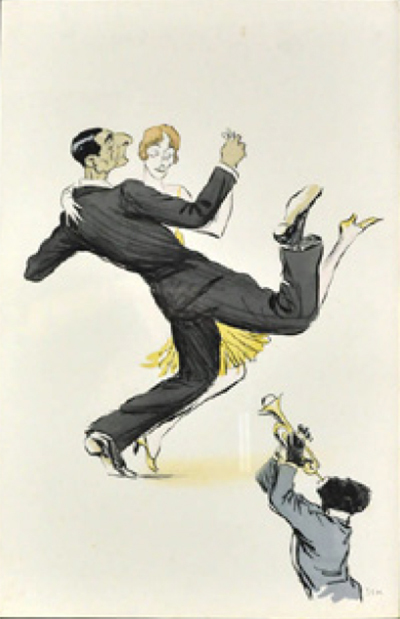 Published in 1927, White Bottoms by SEM (Georges Goursat) is considered by many to be the most decorative, charming and electric work illustrating the joy and excess of the Jazz Age. 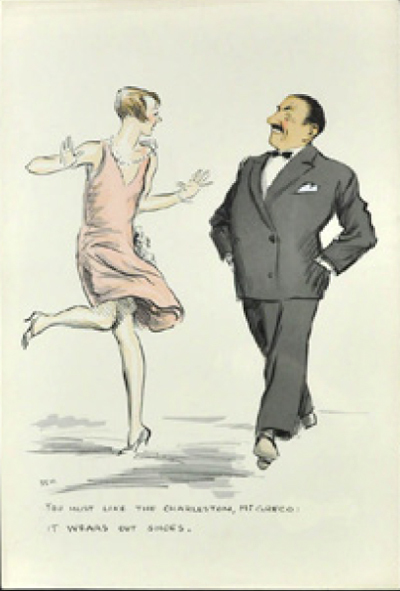 ; the title humorousy refers to the Black Bottom, the dance craze that overtook the Charleston as the era's trademark leg-play. The figures almost dance off the plates and into your lap to le jazz hot you can almost hear from the cats laying out wild rhythms and frenzied riffs. Everyone cuts loose. The energy is palpable. 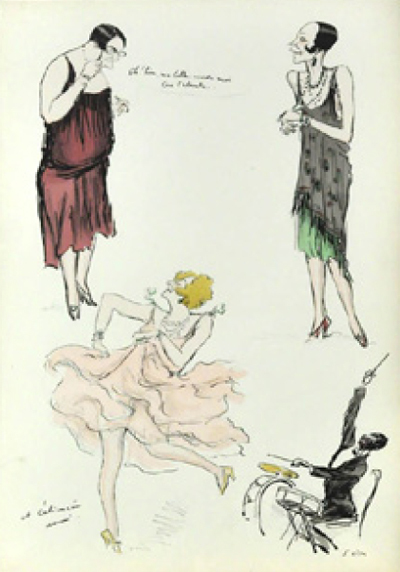 This is Parisian high society of Le Belle Epoch grown-up and co-opting the flaming youth culture of the Roaring Twenties before their own flame dies down and out. 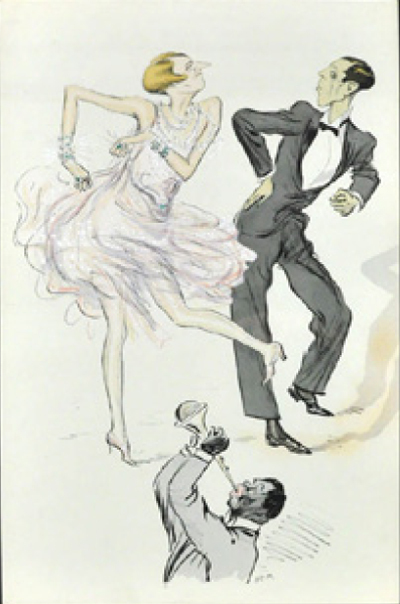 High society is slumming in safety here, embracing the thrills without the danger, the highly animated last gasp of forty-to-fifty-somethings, many of whom have gotten a bit thick around the middle. Matrons throw themselves into it with abandon while older gentlemen rev-up what's left of their engines in the company of young dolls or women of a certain age from the neck up trying to hold their own from the waist down. Everybody is having a great time. Georges Goursat was born into comfortable circumstances. When he turned twenty-one he came into an inheritance that allowed him to indulge his youth. He could have been a wastrel but he had a natural gift as a caricaturist and worked to develop it. 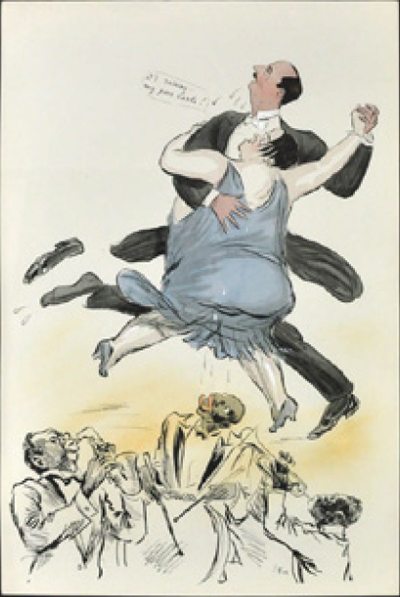 He signed his first self-published albums, issued in the late 1880s, as SEM, reportedly in homage to CHAM, the 19th century French caricaturist born Amédée de Noé. 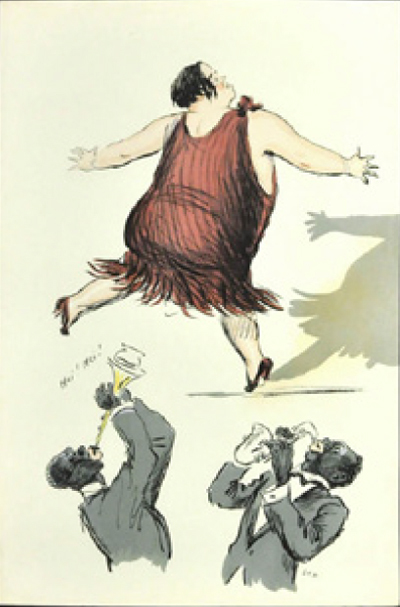 During the 1890s, while living in Bordeaux, he began to contribute caricatures to magazines, and was influenced by graphic artist Leonetto Cappiello. At the same time, while visiting Paris, he designed posters that were printed by the studio of master poster designer, Jules Chéret. He moved to Paris in 1900 and entered its high society as a monied aficionado of the sport of kings. Firmly in the saddle of the horsey-set, Goursat, just three months after his Parisian debut, self-published Le Turf, featuring many of the city's socialites. It was a smash and its success brought him instant celebrity. Over the next thirteen years he self-published ten other albums caricaturing the Parisian upper-class. The war years saw a different SEM. He was a war correspondent and issued two albums of war sketches, images far afield of his previous work. 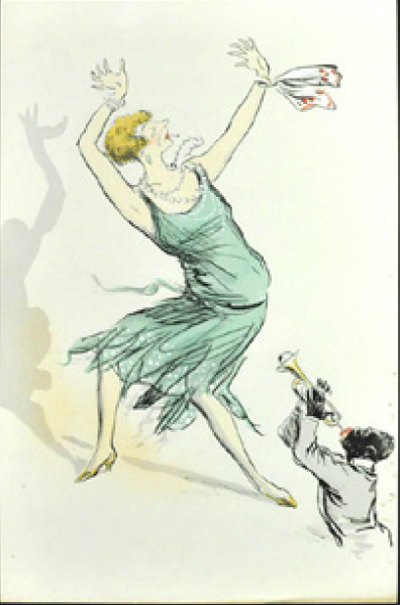 The post-war years saw a return to his former style, his first album of the new era, Le Grande Monde à l'envers (High Society Upside-Down), published in 1919. In his sixties during the 'Twenties he self-published Le Nouveau Monde (The New World), caricatures in three volumes. He was at this point an observer rather than participant in the devil-may-care culture that had swept Europe and America after World War I. In 1923 he became an officer in the Légion d'honneur. By the time White Bottoms appeared toward the end of the decade he was tired; it was his last burst of energy. The financial crisis of 1929 impoverished him. He had a heart attack, and later died in 1934. 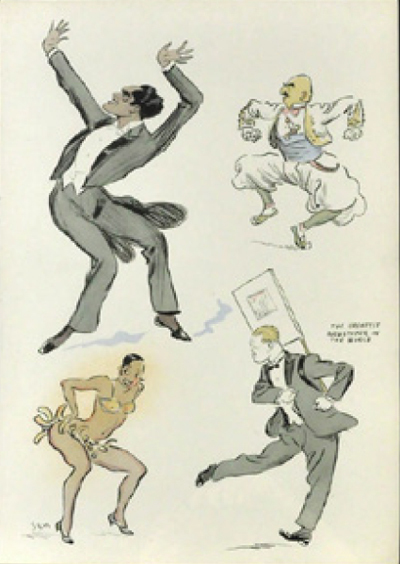 Note Josephine Baker at lower left. 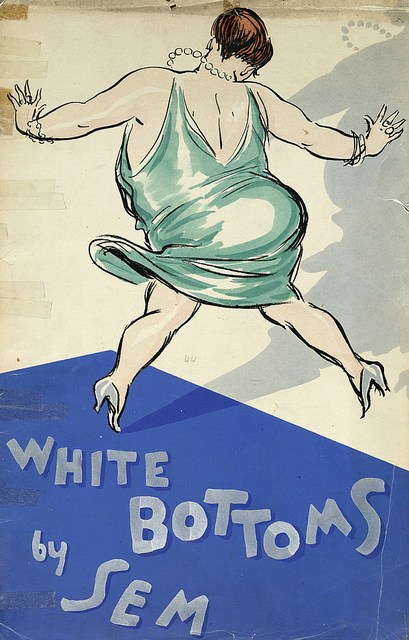 White Bottoms remains the most pointed and illustrative depiction (and certainly the most gently humorous), of the aging Parisian upper-class of the era as it frantically pursues pleasure while it still can. It is, in retrospect, a fraught record of the last days of full sun in Paris before the cold eclipse of the 'Thirties darkened spirits, a depressing crash after a decade-long cocaine-like binge. OCLC records only two complete copies in institutional holdings worldwide. It is of the utmost rarity compete with all of its forty-three pochoir plates present. Sets were very soon, alas, routinely broken-up to individually sell the images; incomplete copies are the norm, if you can find them. No copies in any state of completeness have come to auction within the last thirty-six years, per ABPC. SEM (pseud. of Georges Goursat 1863-1934). White Bottoms. Paris: n.p. [by the aritist], 1927. First edition. Folio (20 x 13 in; 51 x 33 cm). Forty-three plates in pochoir, loose in portfolio as issued. Illustrated wrappers. All images, except that of the wrapper, courtesy of Shapero Rare Books, currently offering the eight plates seen here from the album (excluding the upper wrapper).